This is a new companion volume to the Lotus 35 history reviewed previously and produced to the same high standard by the acknowledged marque expert Kevin Whittle who, among other qualifications, is the Lotus 19 Registrar of the Historic Lotus Register. He also owns a truly authentic replica of this very rare Lotus model which has been built over several years and which he plans to use for hill climbing and other speed events. The Lotus 19 followed in the footsteps of Colin Chapman’s great rival Cooper’s successful ‘Monaco’ sports racer in that it was really a two-seater version of the current grand prix car, the Lotus 18. This was also Chapman’s first rear-engined single seater, again emulating his rivals’ long-standing approach to car construction. Of very similar appearance to the Cooper Monaco, the Lotus was, not surprisingly, soon dubbed the ‘Monte Carlo’. In the hands of Stirling Moss, who played an important part in testing the prototype Lotus 19 at the time when he was recovering from a major accident – in a Lotus 18 – at Spa, the car won its first race, a 75 mile sports car race at Karlskoga, Sweden. Thus encouraged, twelve more 19s were built, three of which went to the British Racing Partnership to race in Europe and the remainder went to America where Dan Gurney was among the first to achieve success in one at Nassau, Daytona and elsewhere. In all, seventeen Lotus 19s were made. In fact, it was across the Atlantic that the Lotus 19 would achieve most of its success, especially when fitted with larger Buick, Ford or Chevrolet engines. At home, where the 19’s favoured 2½ litre Climax FPF power unit was in strong demand for Formula 1 use, the cars were a much rarer sight and, perhaps partly for this reason, the model’s history has been largely overlooked in books on Lotus sports cars in favour of the front-engined cars and the more popular 23. Whittle’s purpose in writing this book was to try to restore the balance and this he has achieved. He starts with a review of the racing career of the single seater Lotus 18 – of which some 150 examples were produced in Formula Junior guise as well as F1 and F2 – before moving on to that of the sports car on which it was based. Chapters on the chassis, suspension, wheels and tyres, panelling and bodywork and transmission describe the Lotus 19 in very considerable detail, ending with a fully illustrated account of the building of Whittle’s own, 3½ litre V8-engined replica. 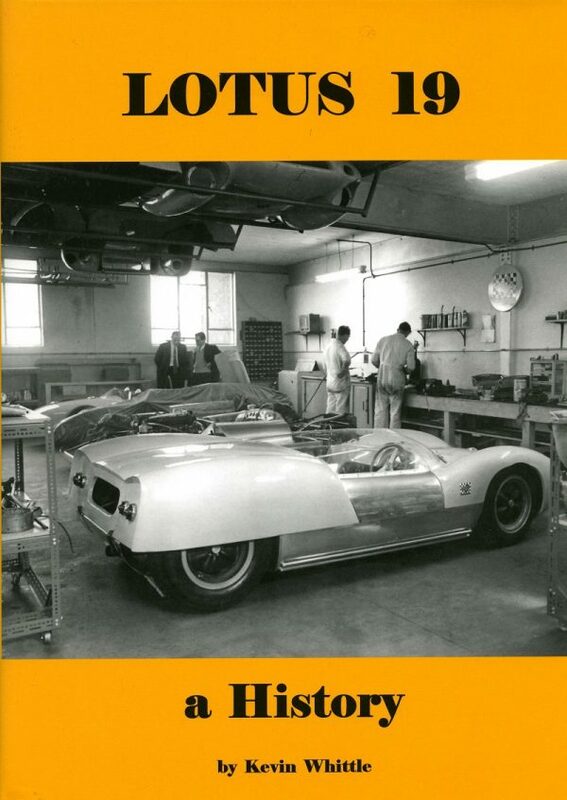 The book’s foreword is written by Tony Robinson who was chief engineer at British Racing Partnership and the photograph which graces the cover and which also appears inside shows the team’s Lotus 19s in the BRP workshop. Like all the photographs, it is very well reproduced. At just £40 plus p&p, this large format, hardback book, printed on high quality paper, represents excellent value, especially of course to anyone seeking a detailed account of the hitherto somewhat ‘overlooked’ Lotus.